Bands[a] are a form of formal neckwear, worn by some clergy and lawyers, and with some forms of academic dress. They take the form of two oblong pieces of cloth, usually though not invariably white, which are tied to the neck. The word bands is usually plural because they require two similar parts and did not come as one piece of cloth. [b] Those worn by clergy are often called preaching bands, preaching tabs, or Geneva bands; those worn by lawyers are called barrister's bands or, more usually in Canada, tabs. In the early sixteenth century bands referred to the shirt neck-band under a ruff. For the rest of the century, when ruffs were still worn, and in the seventeenth century, bands referred to all the variations of this neckwear. All bands or collars arose from a standing neck-band of varying heights. They were tied at the throat with band-strings ending in tiny tassels or crochet-covered balls. Bands were adopted in England for legal, official, ecclesiastical, and academical use in the mid-seventeenth century. They varied from those worn by priests (very long, of cambric[c] or linen, and reaching over the chest), to the much shorter ecclesiastical bands of black gauze with white hem showing on the outside. Both were developments of the seventeenth century lay collar. The bands are two strips of bleached holland[e] or similar material, falling down the front from the collar. Plain linen 'falling bands', developed from the falling collar, replaced the ruff about 1640. [f] By 1650 they were universal. Originally in the form of a wide collar, tied with a lace in front, by the 1680s they had diminished to the traditional form of two rectangles of linen tied at the throat. Bands did not become academically significant until they were abandoned as an ordinary lay fashion after the Restoration in 1660. They became identified as specifically applicable to clerical, legal and academic individuals in the early eighteenth century, when they became longer and narrower in form. 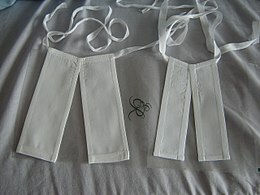 Mourning bands, which have a double pleat running down the middle of each wing or tongue, are still used by barristers. Clergy may also wear bands, which may be of black material, which are also known as Geneva bands. By the end of the seventeenth century Queen's Counsel wore richly laced cravats. From the later part of the eighteenth century they wore bands instead of the cravat as undress. In the eighteenth century a lace fall was often used as an alternative to the bands by judges in full dress. The standing bands, a semi-circular collar, the curved edge standing up round the back of the head. While the straight horizontal edges in front met under the chin and were tied by band-strings, the collar occasionally was worn turned down. It was supported on a wire frame attached to the neck of the doublet behind. The starched collar rested on this. It was usually of linen, but also lawn[h] and lace. [page needed] They were popular for a quarter of a century. The soft, unstiffened collar draped over the shoulders of the doublet were called falling-bands. Until the Civil War barristers wore falling bands, also known as a rabat, with about six tabs arranged one upon the other, and having the appearance of ruffs rather than bands. They differed from the bands of the clergy of that period in that they were not poked as the latter were. Lawyers took to modern bands about the middle of the seventeenth century. They continued in ecclesiastical use well into the nineteenth century in the smaller, linen strip or tab form- short-bands. These are retained by some priests of the Church of England, academics, lawyers, and ministers of the Church of Scotland, the Presbyterian Church in Ireland, and the English non-conformist churches . Bands were adopted early in the eighteenth century, by parish clerks and dissenting ministers, as well as by clergymen of the established churches in Europe. The bands were fairly wide, set close together. The outer white edge is the hemmed linen fabric which, being turned over onto itself three times, is opaque. The cravat or neckcloth was popular 1665–1730. [page needed] It was a large square or triangle of linen, lawn, silk, or muslin,[j] often starched, with the ends usually bordered with lace, or decorated with tasselled beads, and tied loosely beneath the chin. Formal cravats were always plain white, otherwise they could be coloured or patterned. Tying the cravat in a bow was popular circa 1665. Fastening with a cravat-string was popular circa 1671. By 1680–1690 the cravat was worn falling over a stiffened ornamental cravat-string. 1695–1700 saw the Steinkirk style, with the front ends twisted and the terminals either passed through a buttonhole or attached with a brooch to one side of the coat. The cravat was popular until the 1740s, and with the elderly thereafter. In the 1840s several types of cravat were in use, the most traditional being a large bow with pointed ends. The variety of neckwear became very much greater in the 1890s. The scarf, formerly known as the kerchief, was also worn. In the 1890s neckties became popular, commonly in a butterfly- or batswing-shape bow. [k] By the 1850s separate, starched, collars were standard, these reaching three inches in height by the 1890s. Until about 1950, apart from short-sleeved, open-necked sports wear, day shirts always had a long sleeve with cuffs, closed by links or buttons, and with a neck-band with separate collar fastened by studs, or an attached collar. The attached collar is now dominant. The result is that bands are rarely used by graduates, who prefer the contemporary down turn collar and neck tie. ^ According to the Oxford English Dictionary, since the 18th century these have been called bands rather than by the singular band. ^ It is similar to jeans, another form of clothing that goes by the plural. ^ A fine light- or medium-weight plain batiste weave, usually of cotton, but also linen. Finished with a stiffer, brighter smoother finish. Finer cambrics are converted from heavier lawn-type cloths, cheaper cambrics from carded-yarn print cloths which are back-filled with china clay and starched for weight and appearance. Batiste is a highly mercerized, soft-finished, lightweight, combed-yarn, converted, lawn-type fabric, bleached, dyed, and printed. It is used for women's and children's lingerie, nightgowns, summer dresses, infants' wear, lining. ^ They were also worn by attorneys whilst the latter were members of the inns of court. ^ A linen fabric woven from the fibres of flax, holland is a fine white linen lawn, first made in Holland. It was used for mourning cuffs and head-dresses before the introduction of white mourning crape in the early nineteenth century and white cotton muslin in the late eighteenth century. Mourning crape, or crepe anglais as it was called in France, was a transparent crimped dull black and white silk gauze, made by Courtaulds until production ceased in 1940. ^ The falling collar, which had the collar turned down on the shoulders, was developed in the early seventeenth century. This largely replaced the ruff, although that continued well into the seventeenth century. Towards the end of the sixteenth century the ruff was sometimes worn open in front rather than completely encircling the neck. Both types of ruff retained the deep projecting starched frill of several separately goffered folds of linen or muslin, and supporting standard, which arose in the sixteenth century. ^ In a practice reminiscent of the University of Oxford, where certain senior officers wear bands with white bow ties, the wearing of both bands and jabot by Queen's Counsel is rather unnecessary. The bow tie was developed from the cravat, introduced in the mid-seventeenth century. This was an alternative to the fall lace or jabot, and was of linen or muslin, with broad edges of lace. It varied from the tied lace cravat with long flowing ends, to an elaborate folded and lightly starched linen or cambric necktie of lace, used in the late eighteenth century to the early nineteenth century. These eventually became the modern necktie. It makes no sense to wear both types of neckwear, the bands and bow tie. The jabot itself was an atrophied form of the starched and elaborate ruff, which developed over a period of fifty years from the lace edged and frilled exposed linen chemise. It is not an especially modern error which sees bands and necktie worn together. In 1770 non-doctors and DMus at Oxford were required to wear (very small) bands and cravat, and all others excepting DMus, bands alone. ^ A very light, fine, translucent, smooth, hard handling, plain woven fabric of linen now cotton or synthetic. Lawn usually more closely woven and stiffer than cambric. ^ Band-strings were the white-tasselled ties used for fastening neckwear, whether bands or ruffs. ^ Of the several varieties of plain weave cotton cloth, the thin batiste and nainsook, rather than the heavy sheeting such as longcloth and percale. Muslin, or muzline, is a finely woven, lightweight cotton fabric with a downy surface. Named after the town of Mosul, near Nineveh, it was introduced into England from India circa 1670. Machine-made by the 1780s, it gradually replaced linen hollands and cambrics. ^ Popular for evening wear in a white material such as piqué, a stiff, ribbed cotton fabric. This is the shape modern neckties are tied in. In the early twentieth century the "bow" tie was more popular, from the 1920s the knotted one. ^ a b c d e f g Cunnington & Cunnington 1972. ^ Hargreaves-Mawdsley 1963, p. 40. ^ a b Hargreaves-Mawdsley 1963, p. 66. ^ Beck 1886, p. 164. ^ Beck 1886, p. 70. ^ Hargreaves-Mawdsley 1963, p. 86. ^ Hargreaves-Mawdsley 1963, p. 90. ^ Planché 2003, p. 33. ^ Beck 1886, p. 231. Beck, William (1886). The Draper's Dictionary. London: The Warehousemen and Drapers Journal. Cunnington, C. Willett; Cunnington, Phillis (1972) . Handbook of English Costume in the 17th Century (3rd ed.). London: Faber & Faber. Hargreaves-Mawdsley, W. N. (1963). A History of Legal Dress in Europe until the End of the Eighteenth Century. Oxford: Clarendon Press. Mayo, Janet (1984). A History of Ecclesiastical Dress. New York: Holmes & Meier Publishers. Planché, James Robinson (2003) . An Illustrated Dictionary of Historic Costume: From the First Century B.C. to c. 1760. Mineola, New York: Dover Publications. ISBN 978-0-486-42323-4. Wikimedia Commons has media related to Bands (neckwear). Cox, Noel (2000). "Bands". Academical Dress in New Zealand. Archived from the original on 27 October 2009. Retrieved 12 March 2018.